Okuma Alarm-D 4067 Maintenance necessary Filters for which the periodic maintenance was necessary became longevities. Please exchange filters that became longevities. Code 1:The air filter for Absoscal became longevity (17520h)…. 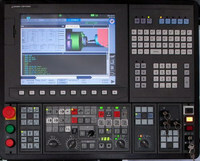 Okuma Alarm-D 4069 Turret index sequence has not ended. Okuma Alarm-D 4055 Safety speed clamping It is in a safety speed limit by the value which had set in data file. Object Axis,Turret Measures to Take Close the guard. Okuma Alarm-D 4076 CAS software calculation error When the early collision detection, the operation error generated the instruction route by the operation processing to which the straight line was approximated…. Okuma Alarm-D 4084 Virus has been detected. Okuma Alarm-D 4065 FL-net transmission error Object None Character-string Node number converted into character-string Code 1: Wrong (parameter) data 2: Buffer full Probable Faulty Locations 1: Node number is wrong…. Okuma Alarm-D 4091 Var. lost motion cannot be applied. Okuma Alarm-D 4091 Var. lost motion cannot be applied. It is invalid though Variable lost motion is selected, because MCS firmware version is old, or Data transfer is not completed….